If you’re anything like me, sometimes you stand in the pet food aisle at PetSmart just in awe of all the different types of cat foods–kibble or wet, no grain, organic, raw… it can be a little overwhelming, right? Since we’ve had the boys, we’ve always fed them kibble during the day and they are allowed to have wet food at night. Hugo will literally eat ANYTHING, but Jack and Ben (believe it or not) are much pickier (and Desmond was too). It was really hard to find a cat food that everyone liked and would actually eat. Until I started feeding them Purina Pro Plan®. And this year, Purina has upped the game! New Purina Pro Plan® SAVOR® Shredded Blend is our new favorite kibble. It combines that crunchy kibble the boys enjoy with meaty shreds that they just can’t get enough of. We like the Chicken and Rice flavor, but they have Salmon and Rice, too! This post is sponsored by Pro Plan SAVOR Shredded Blend and the BlogPaws Professional Pet Blogger Network. 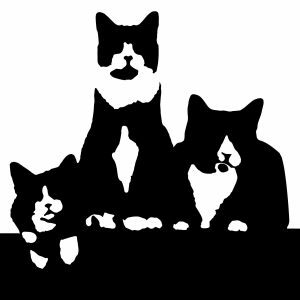 I am being compensated for helping enrich the lives of cats, but TuxedoTrio only shares information we feel is relevant to our readers. Pro Plan SAVOR Shredded Blend is not responsible for the content of this article. We were actually lucky enough to try a sneak peek of this new kibble before it hit the market. Earlier this summer, I captured this photo of Jack, my pickiest eater, enjoying his meal. Needless to say, we waited impatiently for a few months until it was actually released to the market. The number 1 ingredient is chicken or salmon. This is a big game changer for us because we want to know that the kibble we’re feeding the boys contains real meat. Contains omega-6 fatty acids to promote healthy skin and coats. People are always asking me about the boys’ silky smooth fur and soft paw pads. Now you know our secret! Contains natural prebiotic fiber, which helps with digestive health. I don’t think any pet owner would argue with that! Contains vitamin A and taurine, which help promote healthy vision. Because we want them to be bird watching for a long, long time. So, where can you buy these delicious morsels your cat will love? PetSmart sells it! In fact, if you have been to a PetSmart recently, you might have seen one of these displays in the cat food aisle. Click here to purchase the new Savor Shredded Blend directly from PetSmart and make sure you follow our friends at Pro Plan Cat on Instagram, Twitter, and Facebook!